In today's world education has become more of a priority than ever before. There are many professions that in the past may have required a lesser degree of studies, however these same positions now require a higher level. The workforce is becoming much more competitive especially for those affected by a collapse of the economy. Parents today are setting higher standards for their children. This can be very stressful on both parents and children. Some families turn to tutoring in hopes that their children will better their academic achievements. Tutoring is for those students who are failing in the classroom or who need remedial work. For many parents in other communities though, tutoring is a way of life. It’s how they help their children get better grades in school, and on entrance exams and standardized tests. - Test prep materials for all 50 states (including state standards and Common Core). Plus! Parents can customize each child's program by choosing practice questions for state standard, Common Core and IQ tests, assessments required for entry into gifted and talented programs as well as testing needed for private school admissions. Studies have shown that parental involvement with a child's education at home instills confidence, improves overall academic success and helps kids perform at their highest levels on test day. We also feature supplemental educational activities for specific subjects, like reading, math, science, social studies, programming, digital media and more! 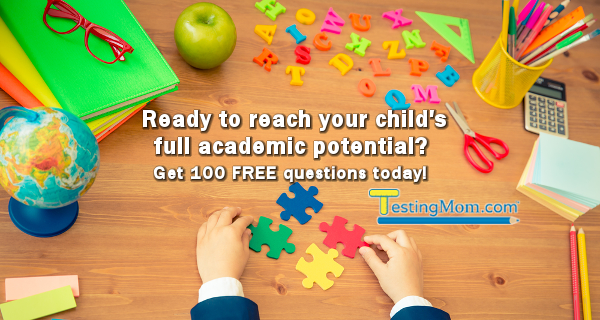 What methods do you use to help your children to succeed academically? Do you get assistance from a tutor? 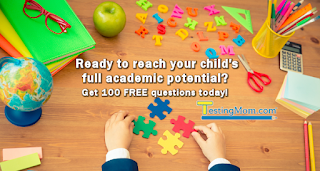 Click on the link below for a chance to win a 1 year subscription of Testingmom.com! Great post and I love the video! I'm going to have to look further into this. I have two boys struggling with math and I'm at my wits end trying to figure out how to help them and it's difficult because I'm terrible at math! I like the part where you say tutoring is a way of life. If we put too much pressure on our kids for school then they are going to be misrable for many many years. But for kids school should be fun. This is really great to know, thank you! Aiding your child's educational development is really important. This sounds amazing! That's exactly how parents can help, by getting involved with their child's education and not leaving it all to the teachers. This is a great program to help parents achieve just that. I don't have kids, but I am a teacher. I think that unless there is a real area of need, let your primary kids play when they get home. Their brains get crammed all day at school! I have never heard of this website before. This is great for kids who need help. Never thought about looking on the Internet for this. This sounds like a wonderful resource. Thanks for sharing! I never heard of this website before but I'll look into it. Usually we let our 7 yr old play some games or watch tv after coming back from school. He needs to have some leisure time. Very nice tips and thank you for sharing. This sounds really interesting, what is the cost like? I'm going to have to look into this online learning program! It sounds like the perfect solution for parents. It would be nice to follow this program instead of hiring a tutor. I love online tutoring support options such as this that promote more parent-child experiences with learning and bonding. Sharing this to my sister!